Captain George’s Seafood Restaurant in Kill Devil Hills, N.C. is open for business. Despite Hurricane Florence and three other major hurricanes hitting the location hard in the past nine years, the composite shake roof on the restaurant has provided security for the oceanside structure. “We’ve been through at least four major hurricanes and maybe four big nor’easters since we opened with absolutely no roof damage,” says Bambos Charalambous, general manager for Captain George’s Seafood Restaurant in Kill Devil Hills. “Despite facing Category 3 hurricane winds reaching up to 120mph, the DaVinci Roofscapes roof overhead has held up incredibly well. There’s not one roof tile that has come off our building. Constructed in 2009, the seafood buffet restaurant gained an addition in 2016 and now seats a total 500 people. Both the original structure and the addition feature DaVinci shake roofing overhead, with the main restaurant featured in a Mountain blend color. The composite roofing material is constructed to resist severe winds, and has both Class 4 impact and Class A fire ratings. Located just two blocks from the Atlantic Ocean on the Outer Banks of North Carolina, the popular restaurant has seen some of Mother Nature’s worst fury. In the time since its construction, Hurricanes Irene, Matthew, Arthur and Florence have all pounded the seaside location. 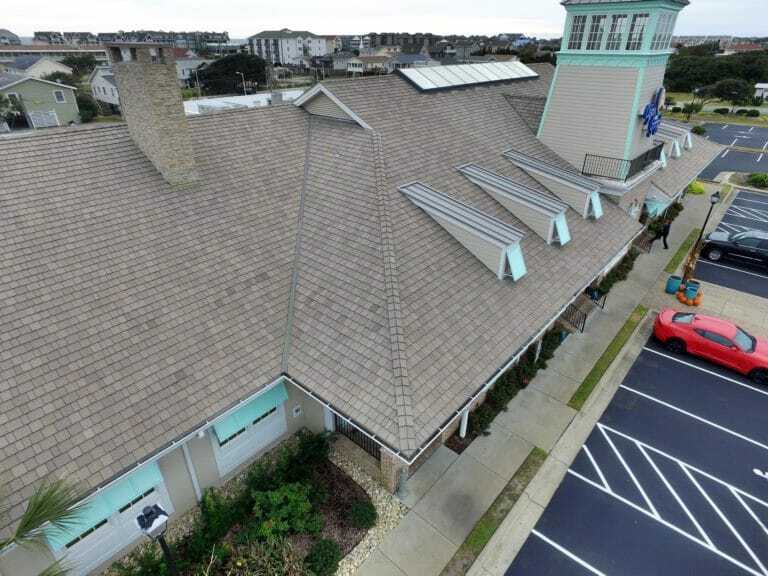 In addition to the restaurant, Simpson’s crew has installed DaVinci roofing products on several other businesses, including a motel and a Fresh Market store in the Outer Banks. “The DaVinci product is strong and dependable,” says Simpson. 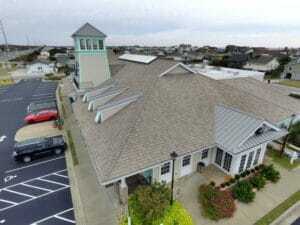 “When we come across any customer with a possibility of using a synthetic roofing product we’re recommending DaVinci.